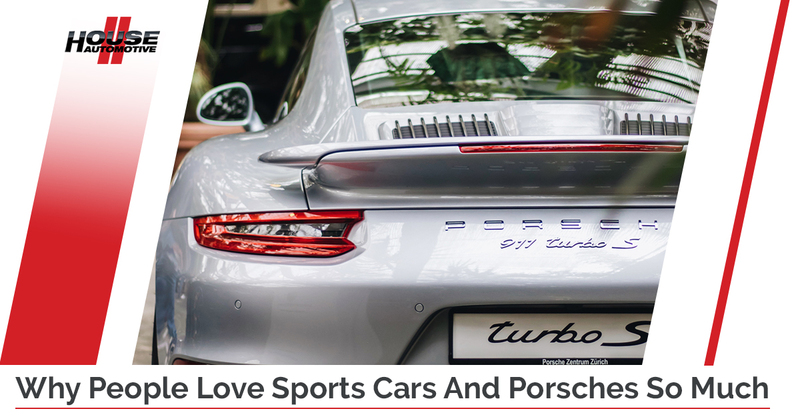 Consider this another appreciation post for all things Porsche-related as well as the automobile in general – well, more specifically sports cars. Why is it, exactly, that people spend incredible amounts of money for a machine that accomplishes the same purpose as cars that cost a fraction of the amount? If all cars will get you from Point A to Point B, from a logical or practical standpoint, it just doesn’t make sense. Plus, sports cars are generally less reliable, have a significantly lower ground clearance, and cost a fortune to insure. So, who in their right mind would want to own and drive a high-performance sports car? People who care about the driving experience are the crazy people who own sports cars. Sure, maybe these gas-guzzling vehicles aren’t the most pragmatic of transportation vessels, but they’re fun. Sports cars are exciting, putting thrill and adrenaline into the driving experience as the engine roars and the tachometer needle nears redline. At HOUSE Automotive, our Pasadena independent Porsche repair specialists wouldn’t expect Prius drivers to understand driving for the sake of pure enjoyment and giddy fun, but we know that our fellow Porsche enthusiasts get it. We don’t mean to sound elitist about our driving preferences; everyone has their own way of getting around and our Porsche repair shop totally respects that. But hey, we can at least write sports car appreciation blogs, right? To get the Porsche car repair you need in Pasadena and the greater Los Angeles area, whether it’s Porsche Cayenne repair or Porsche transmission repair, trust our independent Porsche auto repair to take good care of you. Learn more about our services here. Sure, taste and style are subjective things, but nobody invests in a nice sports car because it’s ugly. While interior luxury and performance are two important points when shopping for a sports car, if you’re paying six figures for a car, you’ll want it to look really, really good. A good sports car should be regularly garaged, and taken out when the weather is nice and downtown is ripe with activity. Even though your 911 Carrera can easily go 0-60 in less than 4 seconds, it looks much better rolling around at 20mph downtown. If you’ve purchased a sports car that you have to double or triple-take every time you park it, then you’ve done well. “How is this a good thing?” you might be wondering. Well, strictly from a safety standpoint, it’s not a good thing. But in terms of appeal, in the same way that people enjoy horror movies or rollercoasters, the thrill and adrenaline-rush of the high-performance driving experience is incredible. The feeling when you downshift into second gear and stomp your foot on the floor might be the single greatest any human could experience, although we are biased (please note that HOUSE Automotive does not encourage or condone reckless or dangerous driving). According to WebMD, by experiencing something that seems at least mildly life-threatening, many people feel as though they have overcome a great challenge, making thrills like driving a fast car not only appealing but actually addicting. So, contrary to popular belief, a little bit of danger does feel good, and of course, a lightning-fast sports car can deliver this sensation at moment’s notice. Earlier, we mentioned that sports cars are very visually attractive, and that’s a huge selling point for them. While that’s completely true, the design itself is what really takes these machines to another level beyond regular automobiles. The main appeal of a sports car’s design is the fact that it complements its main function – to deliver stellar performance on every mountain road and hairpin turn. From the aerodynamic silhouette to overly wide tires, everything that a sports car has to offer is there with the intention of making it accelerate quickly, brake on a dime and handle corners with the utmost levels of precision. We could go on and on about our appreciation for sports cars, but we’ll leave it at that. To get the best levels of performance from your Porsche, make sure to visit HOUSE Automotive in Pasadena for reasonable Porsche repair costs, Porsche Boxster repair and the best independent Porsche repair in the area. Learn More About How We Can Treat Your Sports Car Right!